Dunlop MSA British Touring Car Championship history was made today (16 September) when the entire 32-car field was covered by less than a second – for the first time ever – in a remarkable qualifying session at Silverstone. Eurotech Racing’s Jack Goff claimed the honours, and with it his second career pole position, as he edged out Speedworks Motorsport’s Tom Ingram by an incredible 0.001s. The young duo had signalled their intentions by taking the top two positions in the final practice session earlier in the afternoon, but it was roles reversed when it really mattered as Goff steered his Honda Civic Type R to a pace-setting 58.653s lap time. “The car was pretty lairy actually but brilliant to drive,” enthused Goff. “To get pole in the Type R, which isn’t as suited as some to Silverstone, is a great achievement. Adam Morgan claimed his Ciceley Motorsport Mercedes A-Class was ‘on rails’ as he fell short of pole position by just 0.049s, claiming third in the process, whilst triple BTCC champion Matt Neal completed the second row order. The Team HARD stable enjoyed an extremely competitive day around the 1.64-mile National circuit as Jake Hill grabbed fifth ahead of Rob Austin’s Handy Motorsport Toyota. Ant Whorton-Eales produced his best ever qualifying performance by taking seventh for AmDTuning.com with Cobra Exhausts, with the young Lichfield driver also being the highest placed rookie in the final classification. Aside from the sensational battle up top there was also the small detail of the BTCC title race to focus on, which saw Team BMW’s Colin Turkington pipping championship leader Ash Sutton in the session. The Northern Irishman will line-up eighth with Adrian Flux Subaru Racing’s Sutton in tenth. Wedged between the title protagonists on the timesheets was the impressive Brett Smith, in only his fourth qualifying session, as he topped off a hugely successful day for Eurotech Racing. Jason Plato in 11th and Gordon Shedden in 12th were notable absentees from the top ten, whilst BMW man Rob Collard has it all to do to keep his title hopes alive from 22nd on the grid. Such were the margins during the 30-minute session that Team Parker Racing’s Stephen Jelley brought up the rear of the field in 32nd place – just 0.886s slower than Goff’s pole position lap. 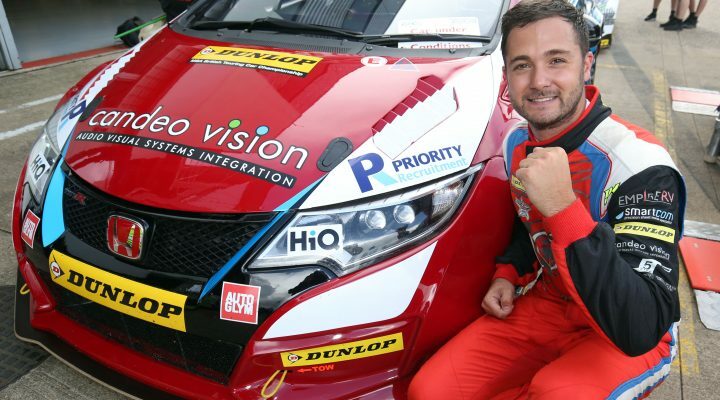 Three pulsating BTCC encounters are set to take place at the home of British motorsport tomorrow (17 October) with tens of thousands of fans likely to attend Silverstone, with many more watching the action unfold live on ITV4 from 11:00am.